Hey, Fort Wayne folks! Right here in our neck of the woods, Matt and Ann Merritt are attempting to accomplish exactly what I feel like the future needs for our food production. Kudos to their hard work. I plan to visit their booth at our new year-round farmer's market that gathers every first Saturday of the month (see details here), and begin to get to know them. I especially like that as they searched for land, they were dedicated to finding a space that would be accessible to urban and suburban areas, even though they could have found a more rural property. When I picture the future of locally grown food, I see this! I'm so very excited to see real people putting into action all of my ideals! Matt Merritt tours his greenhouse at ATOM Acres. 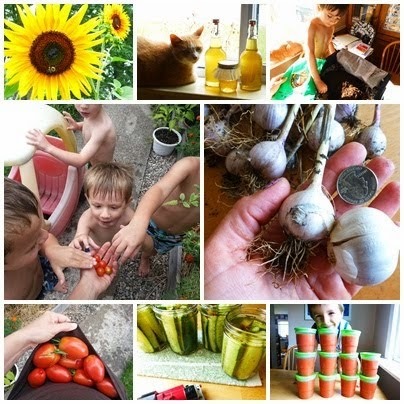 The Merritt family grows vegetables and herbs to sell locally. Published: November 11, 2012 3:00 a.m.
Merritt checks his kale for bugs in the greenhouse. Merritt carves away the comb to harvest his honey. Matt Merritt, wife, Ann, and sons Trace and Oliver plant kale in the greenhouse at ATOM Acres. Matt Merritt is standing inside his kitchen on a recent sunny, if chilly, October morning. A beehive, honey dripping from honeycombs, lies in partial disassembly on and under his family’s round oak table. Merritt pulls out a shelf and starts scraping the caps off one of the combs. Then he’ll place the rack in a hand-cranked centrifuge to extract the honey – a job, he says, that his blonde-haired 3-year-old son, Oliver, likes to “help” with. Yes, to Matt and Ann, this is the sweet life – life on what they hope will become a sustainable urban farm. They call their nearly 6-acre patch of ground at the corner of Bass and Thomas roads ATOM Acres, an acronym made from the initials of family members’ first names. From their land – across from a housing development and around the corner and down the street from a major local shopping strip – the Merritts plan to provide year-round vegetables, herbs, flowers and other products to area residents – while educating them about food production and preservation. Nonetheless, the two acknowledge theirs is a long row to hoe. For now, after being able to purchase the land with the help of Matt’s mom and stepfather, Bobbi and Jerry Suetterlin of Fort Wayne, they’ve started with what growers call a hoop house – a plastic sheeted greenhouse – that Matt found at a public sale. Inside, rows of beds are sprouting spinach, kale, Swiss chard and several kinds of leaf lettuce ready for harvest. The produce will be sold at the year-round farmers market at Parkview Field that is open the first Saturday of each month. There are also several kinds of herbs and tiny pea vines that will be planted outdoors in the spring – and a germ chamber for sprouting seeds. On the grounds, about 2 1/2 acres of which are tillable, Matt has eight beds for other vegetables, including broccoli and cabbage now, and tomatoes, cucumbers, peppers and other produce next year. His goal, he says, is not just to sell at farmers markets, but to start a community-sponsored agriculture program, or CSA. He’s not quite sure what form it will take – “Winter is a good time for mapping that out,” he says. But it likely will involve recruiting shareholders who will pay an entry fee and would determine at least in part what foods they’d like to receive. Still in its earliest stages is converting an existing equipment garage into a facility where produce could be sold – with a kitchen where food could be preserved and classes given. If all that sounds idealistically lofty, Matt says, well, it is. But he and Ann, who met in a health foods shop when both were living in Hawaii – “I overcharged him for peanut butter one day, so he remembered me,” she says with a smile – also come to the task with a well-suited background. After working with the chef, Matt went on to study organic farming in a nine-month program at Michigan State University, commuting weekly to East Lansing, Mich., while Ann lived with his parents. There, he learned to manage a hoop house and flower fields, as well the business of structuring and marketing a CSA. He says with the amount of land he has, and only a slightly larger growing space, the university program supported a 160-member CSA, farmers markets and wholesale sales. “That’s a lot of food,” he says. Ann grew up on a 400-acre ranch cooperative in Washington, where dairy cows, pigs, goats, chickens, sheep and horses were raised. She says she started gardening, growing “strawberries, potatoes and petunias” at the age of 9. Later, she lived in Florida and worked for a tree farm and plant nursery while taking botany and related courses at a community college. She says she knew when she met Matt that their goals and experiences meshed. After leaving Michigan State, Matt tried helping friends raise chickens on a farm for a time. But when his parents said they wanted to help him farm on his own, he started looking for a suitable property. The land they found was a fluke. It seems as if the land should be within city limits. But it’s actually in Wayne Township and zoned residential/rural agriculture. Other conventional crop lands lie nearby. By going to farmers’ markets this summer, he’s been building an online newsletter subscription list that he hopes will become a customer base. “One of our biggest goals,” he adds, “is to have heirloom varieties of vegetables that are beautiful and different,” he says, adding he’d someday like to start another Michigan State idea – “an edible forest” of fruit and nut trees. “The whole idea is to get back to local food – food that hasn’t sat in a truck for a week and in the store for a week. We need to get out of the industrial revolution mindset when it comes to food that bigger is better. It can be useful in some ways, but maybe it’s not the safest way or the most economical way,” he says.